Publisher: Moscow; P. Jurgenson. Plate 3347. Description: Children's Album, Op.39 (Tchaikovsky, Pyotr); Pyotr Tchaikovsky was a Russian composer during the Romantic period; Piecestyle: Romantic; Instrumentation: Piano (solo); The score was dedicated to Vladimir Davydov; Opus/Catalogue Number: Opus 39; TH 141; Number of Movements: 24 pieces: | Morning Prayer (Утренная молитва) Andante (G major, 24 bars) | Winter Morning (Зимнее утро) Allegro (B minor, 64 bars) | Playing Hobby-Horses (Игра в лошадки) Presto (D major, 72 bars) | Mama (Мама) Moderato (G major, 36 bars) | March of the Wooden Soldiers (Марш деревянных солдатиков) Moderato (D major, 48 bars) | The Sick Doll (Болезнь куклы) Moderato (G minor, 42 bars) | The Doll's Funeral (Похороны куклы) Adagio (C minor, 48 bars) | Waltz (Вальс) Allegro assai (E♭ flat major, 85 bars) | The New Doll (Новая кукла) Allegro ♭ major, 57 bars) | Mazurka (Мазурка) Allegro non troppo (Tempo di mazurka) (D minor, 52 bars) | Russian Song (Русская песня) Allegro (F major, 30 bars) | The Harmonica Player (Мужик на гармонике играет) Adagio ♭ major, 22 bars) | Kamarinskaya (Камаринская) Vivace (D major, 49 bars) | Polka (Полька) Moderato. Tempo di Polka ♭ major, 30 bars) | Italian Song (Итальянская песенка) Moderato assai (D major, 49 bars) | Old French Song (Старинная французская песенка) Molto moderato (G minor, 32 bars) | German Song (Немецкая песенка) Molto moderato (E♭ flat major, 26 bars) | Neapolitan Song (Неаполитанская песенка) Andante (E♭ flat major, 54 bars) | Nanny's Story (Нянина сказка) Moderato (C major, 48 bars) | The Old Witch (Баба-Яга) Presto (E minor, 45 bars) | Sweet Dreams (Сладкая греза) Moderato (C major, 48 bars) | Lark Song (Песня жаворонка) Die_Lerche - The Lark - L’alouetteModerato (G major, 32 bars) | The Organ-Grinder Sings (Шарманщик поет) Andante (G major, 32 bars) | In Church (В церкви) Moderato (E minor, 52 bars) The above sequence reflects the published editions during Tchaikovsky's lifetime, but some later editions use different numbering based on the composer's autograph score. 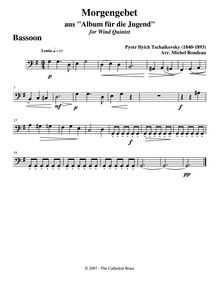 ; For piano|Scores featuring the piano|For 1 player|For flute, oboe, clarinet, bassoon, horn (arr) |For 5 players|Scores featuring the flute|Scores featuring the oboe|Scores featuring the clarinet|Scores featuring the bassoon|Scores featuring the horn.